Florida is on the front lines of a debate over the spread of the controversial drilling technique hydraulic fracturing, or fracking, which raises a crucial question: are the state’s unique geology and hydrology safe for expanded oil and gas drilling? Over the past several months, a number of counties and cities in Florida have banned fracking over environmental concerns. Earlier this year, the state legislature considered but did not pass a bill to regulate fracking at the state level, which would have superseded local bans. So far, there has been at least one exploratory well in Florida using fracking, but the practice is not widespread. However, the question of how and whether to allow fracking is likely to come back up again, as early as next year. How would fracking be done in Florida and what environmental and geologic questions are worth considering? A close look at the particular conditions of the Florida peninsula reveals a number of unresolved areas of concern. In some respects, Florida is an unlikely site for this battle. Florida ranks 31st of the 50 states in energy production. The state currently has two regions with conventional hydrocarbon production – the Sunniland trend in South Florida and the western Panhandle. Hydrocarbons are stored within carbonate rocks, which are composed of limestone and dolostone in South Florida and carbonates and sand in the Panhandle. 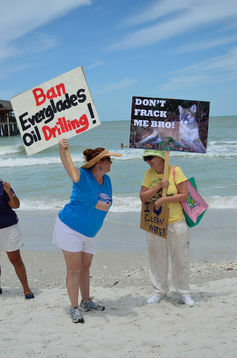 A protest in 2014 against a bill that would allow fracking in Florida, where there are worries over the effects to the drinking water and tourism industry. Potential hydrocarbon reservoir rocks in Florida are distinct from shales – the layers of sedimentary rock in other parts of the U.S. where fracking has led to a drilling boom in natural gas and oil. The rock under Florida generally has a higher permeability, making it easier for liquids to move through it. A fracas ensued when one company in 2013 tested fracking before receiving a permit in Florida, which resulted in a cease and desist order from the Department of Environment Protection (DEP). The company used a technique known as acid fracturing, which is substantially different than what’s more commonly practiced elsewhere in the U.S. In this method, which is suitable only for carbonate reservoirs, acidic water is injected at high pressure into a well to dissolve the rock. Because carbonate rocks are highly soluble, acids can increase pore size and permeability, allowing oil or gas to flow. Elsewhere in the U.S., fracking has gained attention due to its association with two hazards: earthquakes and groundwater contamination. Fracking is a well stimulation technique that entails injecting a mixture of water, sand and chemicals at high pressure into oil and natural gas wells. The fracking fluid pressure breaks up the rocks hosting the oil and gas, increasing their permeability and allowing the oil, gas, natural brine in the rock (called produced waters) and fracking fluid to migrate quickly to the surface. The oil and gas make their way to market, and the fracking fluids are often recovered and reused. The practice of fracturing rock with high pressure does not cause earthquakes but disposal of water that comes up after wells have been drilled has been linked to seismic activity in Oklahoma and other places in the U.S. However, the briny produced waters can pose a problem. They are too laden with dissolved salts to release on the surface, where they would constitute a major pollutant. So, these brines are generally reinjected into the Earth in very deep wells, called injection wells. A growing body of research based on high-quality seismic data collected at surface sites around these injection wells clearly shows that voluminous wastewater injection affects seismicity. Earthquakes in Oklahoma and several other pockets of midcontinent U.S. – including two in Oklahoma with magnitudes greater than 5 since 2011 – have been associated with high-volume deep-well injection of wastewater, a byproduct of oil and gas production. An additional problem associated with oil and gas production is the potential for contamination of drinking water and irrigation aquifers by either fracking fluids or produced wastewaters. Done correctly, production wells can be constructed and cemented to avoid the migration of fluids into the well. However, natural gas and chemicals used in fracking have been found in the aquifers of the Marcellus Shale in Pennsylvania, and poor drilling practices have been blamed for methane entering aquifers. Surface operations associated with drilling may also contribute to contamination. As a result of the experiences in other states, the possibility of fracking in Florida has met strong opposition in some quarters. What would the environmental impact of fracking be in Florida? At this point, there are more questions than answers. The specifics of proposed fracking in Florida are complicated by the very different regional geology of the peninsula. Much of Florida sits atop what is called a karst terrane, a geological formation characterized by a complex, highly permeable and porous carbonate aquifer system. The geology includes an equally complex set of less permeable rock units – called confining units – that are distributed within, around and throughout the aquifer system. Are there are extractable oil and gas reservoirs outside of the currently producing regions of the Panhandle and South Florida? The recent local bans include many regions with no confirmed oil or gas reserves. Shales exist below the carbonate rocks in some locations, but it is unclear if conditions were right for oil/gas to form in those shale formations. Where are the faults that could produce earthquakes in Florida? Wastewater injection occurs in many locations, but earthquakes are much less common. Earthquakes due to wastewater injection require a combination of factors. First, there must be faults that can produce earthquakes and sufficient stresses. Second, there must be fluid pathways within the rock through which injected wastewater can increase the fluid pressure significantly. The locations of basement faults in Florida are poorly known, and although none have been known to generate earthquakes, their ultimate impact on seismicity in the state will depend on knowing their proximity to proposed locations of wastewater injection. Where and how deeply will wastewater be injected? Currently, some of the wastewater from Florida’s oil and gas drilling is injected where it is produced, which are in zones below drinking water. In South Florida, the “Boulder Zone” lies above layers from which oil and gas are drawn and below the tapped ends of the Floridan aquifer system. This cavernous zone receives injected wastewater from oil and gas and from municipalities with little pressure increase. This could possibly indicate that induced seismicity may not occur even following rapid and high volume wastewater injection. Many other parts of Florida do not have such a permeable zone similar to the Boulder Zone, but the precise distribution of permeable and impermeable zones in the Florida subsurface is poorly known, so safe wastewater disposal is highly uncertain. A sinkhole in Florida. The state’s unique geology means water moves rapidly, making the state’s aquifers potentially vulnerable to spills and contaminants. Florida’s geology is significantly different from Oklahoma, where there has been the most seismic activity. In Florida, wastewater injection has generally been above oil/gas producing zones. This means they are farther from deep formations. That could decrease the risk of earthquakes, since earthquake-producing faults occur in these deep formations in locations such as Oklahoma. On the other hand, Florida’s practice results in wastewater injection closer to drinking water aquifers. The confining units within the Floridan aquifer system (FAS) have been extremely difficult to map and are highly variable in thickness and properties. A comprehensive effort to map these and zones of high permeability – which could be suitable for injecting and storing wastewater – and rapid groundwater flow would be a monumental task requiring full-time work from many geologists and geophysicists for decades. In other words, understanding with certainty how effective Florida’s geology is for storing wastewater from oil and gas drilling and its ultimate effect on aquifers will be a huge undertaking. Furthermore, Florida cities have generally tapped shallower aquifers until now. However, as these aquifers become overused, deeper brackish to saline portions of the FAS are being considered as source of freshwater through desalination. These aquifers could be used to store freshwater during wet periods, which would be pumped later during dry times (aquifer storage and recovery). Thus, zones of water used for human consumption may approach those where wastewater would be injected. What will be the impact of surface operations? More widespread production of oil and gas drilling with fracking can result in a larger footprint of operations and more opportunity for surface contamination. Florida’s karst geology contains sinkholes, as well as extensive cave systems, which allow rapid entry and dispersive flow of contaminants into the aquifer system. 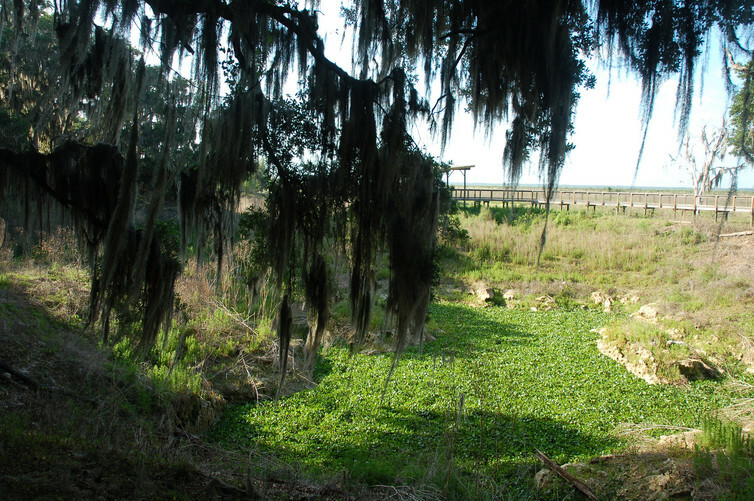 These karst features are obvious in North and Central Florida, where caves can be large enough to walk or swim through. South Florida’s aquifers also have rapid flow. In a 2003 dye tracer study in the Miami region, dyes reached the Miami Dade County well field in hours rather than the expected days. Not only did the dye turn the water red, it exposed the vulnerability of Florida’s carbonate aquifers to contamination. Contaminants could reach irrigation and drinking water systems rapidly enough to pose economic and health risks before any effective warnings could be issued. So although there’s been a sharp debate over fracking in Florida, the focus on “fracking” alone risks losing sight of the bigger picture. Florida’s aquifers are potentially vulnerable to injected wastes, contaminant migration through poorly sealed wells and from surface activities, regardless of whether fracking is involved.